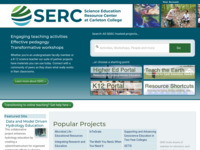 Between November 2012 and February 2013 we added a suite of new features across SERC hosted websites. These new features should make it even easier navigate the rich collections of materials in these websites. Featured Sites Each day a new site or project is featured on the front page, highlighting projects that even long-time SERC users might not have explored. Happening Now This is a list of workshops and other events sponsored by SERC-hosted projects that are happening today. Use it to quickly find the website for the workshop you're attending. Popular ProjectsOur front page project list is now dynamically generated. It reflects the top 20 most visited projects over the last 3 days. So projects will come and go on this lists as workshops and current events generate interest to different projects. Our 'all projects' list has also been reorganized to help you more efficiently find what you need among over 60 different SERC-host projects. Places You've Been If your're logged in to your SERC account we'll show you both projects and individual pages that you've visited recent, so you can quickly jump to the places that matter you. You can also use the favorites feature, described below, to ensure that your favorite project or page is always just one click away. The new front page also puts an emphasis on using the search and site guides to navigate our collections. Search is enhanced with the profile page, best bets, and review status information described below. Our site guide pages, that provide hand-picked starting points for exploring popular topics, have been revamped with even better topic-specific search capabilities. Our favorites and recents pages feature is designed to help frequent visitors quickly navigate to the projects and pages most important to them. An account menu can now be found at the top of most SERC-hosted pages. If you're logged into your SERC account this menu will provide you with a set of links to pages and projects you've visited recently. In most cases this is the quickest way to get back to the workshop/project/page you've recently been focused on. Additionally you can mark any page on the site as a 'favorite' using the 'Add this Page' option in the account bar. That page will then be one click away in the account menu whenever you need it. It can be challenging to identify the best starting point for exploring a particular topic among the diverse set of resources hosted by SERC. We've combed through the sites to identify the best starting places for a wide variety of popular topics and search terms. These Best Bet pages will be automatically highlighted when you search for one of these popular topics. A number of SERC-hosted projects have developed peer review processes for vetting their collections of teaching resources. Activities that reviewers identified as exceptionally strong are now clearly labeled in the search results so you can get to the very best material more quickly. The details of each review process are available as part of the activity descriptions. And we've adjusted search algorithms to ensure that activities that are relevant and well-reviewed are easy to find.